bsebonline.net – Apply Online for Bihar TET 2017 Vacancy for Primary & Middle School Teacher posts: Bihar TET Online Application is not available to apply for BTET Exam 2017. Are you looking for Bihar Teacher Eligibility Test (BTET-2017) Online Application form? As many as 18,000 Govt School Teacher vacancies has to be filled in various District of Bihar. Bihar TET 2017 online application are given below. Online Registration for Bihar TET-2017 has started. Bihar School Examination Board (BSEB) has invited online application for Primary and Middle School Teacher posts for filling up 18,000 vacancies through Employment Notice Bihar TET-2017. These vacancies are to be filled at various Government School in every District of Bihar. We have mentioned the instructions below on how to apply online for Bihar TET 2017 Vacancy. Candidates can apply only through online mode for Bihar TET 2017 Vacancy for Government Teacher jobs. Check out the requirements for online form submission. Before start filling online application make sure candidates have these details. Scanned copy of Signature (Both Hindi and English). Bihar TET Eligibility Criteria details. Candidates who wish to apply online for Bihat TET 2017 Vacancy for Teacher posts in Government school, here is complete details given. Follow these instructions in order to apply Online for Bihar Civil Courts vacancies. Log on to Bihar TET 2017 Online Portal at bsebonline.net [Link]. Click on Online Registration for Bihar TET-2017. The Website will be divided in to two parts Left Side Part for New registration & Right side part is for Application Login who already Registered, For New registration click on PROCEED. On clicking Proceed a window will appear with Instructions in English Kindly read it carefully before proceeding. Fill your Personal Details, Academic Details, Address, Preference details. On Clicking to SAVE a window will appear with your Application Number kindly write down the same for future work. Upload Upload your passport size Photograph, Signature in both Hindi and English. 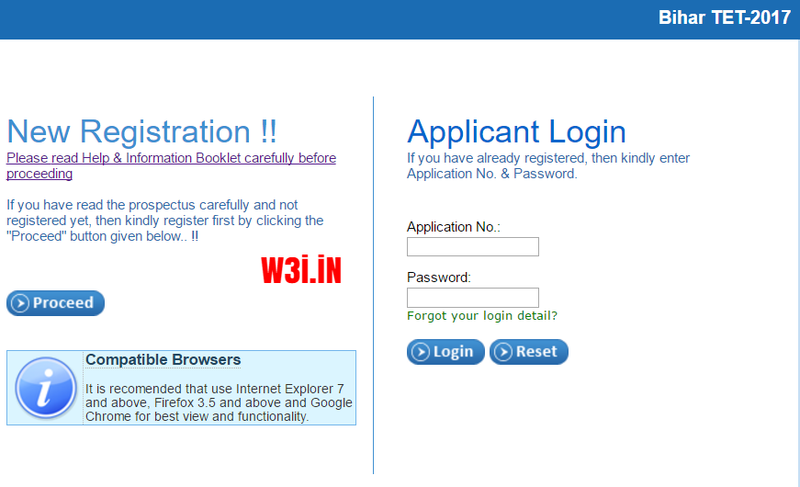 Check on Declaration link and click on Submit button. A Registration No. will be generated note down this. Now you will find MY PAGE where you can see all your details with photo & signature. You have to pay fee click on Pay through Debit card/ Credit Card/ NetBanking/ Cash (E-challan)/ NEFT /RTGS. Fill details and enter your Registration no. You can select any option to pay fee. Please check fee Confirmation on Cash Mode & NEFT/ RTGS will take 2 – 3 days. Visit the same website again at bsebonline.net. Now Enter your Registration No. and Date of Birth. Yes. You have successfully applied for Bihar TET 2017. After confirmation of fee Registration Slip option will available to download the same. kindly take a print of that with you for future purpose. There is no need to deposit the Registration Slip in Board office. Note: Registration Number will be allotted to the applicant after submission of application form successfully. The applicant may login with registration number and his/her date of birth only after allotment of registration number.